What is the Crown without her corgis? The longest-reigning monarch in British history undoubtedly harbors an affinity toward the breed. In fact, many believe that Queen Elizabeth II has owned more than 30 corgis over the course of 70 years. (That’s longer than her marriage to Prince Philip!) Read up on these fascinating facts—and a few scandals—about the Queen. Although English royals have long been devoted to their dogs, none have been quite so commonly identified with them as Queen Elizabeth II. The unbreakable bond between woman and pup began when the Queen’s parents got the royal family’s first corgi, named Dookie, in 1933. She later received her own pooch, Susan, in 1944 for her 18th birthday. Besides tagging along on the Queen’s honeymoon, Susan also gave birth to a pair of puppies in 1949. Thus began the line of royal corgi breeding, which the Queen herself engineered and has lasted for at least 14 generations of dogs. This is why Queen Elizabeth II will never give up the throne. These pups have since become personal companions to the Queen, and she dotes on them—she even calls them 'family.' Her corgis sleep in their own room and eat food prepared by a personal gourmet chef. But besides the endless amounts of love and affection she feels for (and receives from!) them, there’s also a more practical reason to keep her corgis around. They provide a way for the Queen, like any dog owner, to break the ice with strangers with a conversation about their pups. Plus, the daily walks and feedings provide a comforting therapy for her, Vanity Fairreports. Sadly, Buckingham Palace is no longer echoing with the chirps and barks of the Queen’s many dogs. The last surviving member of the royal corgi family, Willow, passed away in April of 2018. And Whisper, a corgi the Queen inherited from a former staff member, passed earlier this week. After the last two members of the royal corgi family, Holly and Willow, were born, the Queen stopped breeding because she didn’t want to leave any of them behind. Fortunately, the Queen still has two furry friends to roam around the palace grounds with. Candy and Vulcan, dachshund and corgi mixes also known as dorgis, keep her company. 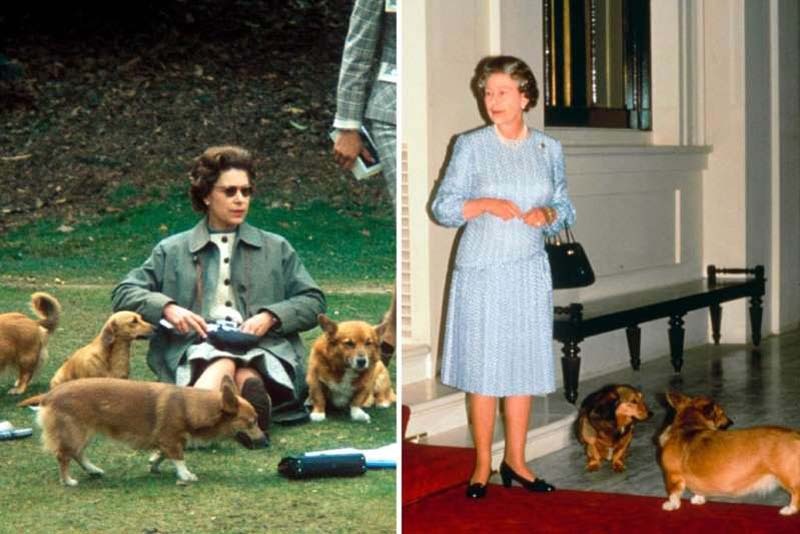 Next, check out these vintage photos of royal dogs throughout history.